You’ve probably noticed that there isn’t a trailer on this page for It Comes At Night. Well, there’s a simple enough reason for there not being one: it’s an incredibly misleading piece of marketing, and does not really represent the ideas and overall tone of the actual film, so when talking about the movie itself it’s best to keep it as far away from its main advertising as much as possible, because one quick play of it and you’ll be thinking you’re going to get a completely different film than what you’re actually seeing. That’s been one of the biggest complaints with audiences towards this film; while it’s got a solid 88% critic’s score on Rotten Tomatoes, the audience score is a much less 44%, and it’s even received a D grading on CinemaScore which is where the public tends to give their own opinions (just for comparison, King Arthur: Legend of the Sword received a B+ on the site – yikes). YouTube critic Chris Stuckmann has devoted an entire video to the differing reactions between critics and audiences, and he makes a strong case for the film’s misleading advertising being the cause of it, which positions it as more of a monster movie with the “it” of the title being some kind of demonic entity or something, but in reality it’s something much more subtle and grounded, which may have put off those who were hyped by those trailers (incidentally, check out that video below, but be warned: it contains heavy spoilers). As for whether the film’s oddly misleading trailers affected my own experience with the film, I at least had the advantage of knowing that what I was getting into was nothing like what the promos were teasing, so I went in just curious to see what the film was like on its own merits, and while there’s lots of stuff to pick apart with this movie, there’s also a ton of interesting and innovative things worth discussing about it, particularly how it uses cinematography and atmosphere to build all kinds of tension far more subtly than many other horror films like it. The set-up is that a mysterious airborne virus has plagued the outside world, and family man Paul (Joel Edgerton) has secluded himself, his wife Sarah (Carmen Ejogo) and their teenage son Travis (Kelvin Harrison Jr.) in a large house in the middle of the woods, where they must wear gas marks when going outside, and must abide to strict regulations about going out after dark. They soon come across an apparently uninfected man named Will (Christopher Abbott), who pleads with Paul to allow him and his own family, including wife Kim (Riley Keough) and their young son Andrew (Griffin Robert Faulkner), to stay in the house away from the deadly outdoors. At first, both families seem to get along fine, but soon their individual paranoias start to get the best of them, and soon everyone is embroiled in a battle of the soul to keep things safe. What really stands out in this movie is the cinematography, which uses the dark atmosphere of this house and part of the outside areas to build a kind of tension that doesn’t necessarily require a lot of follow-up, which suits this movie fine because there’s scarcely any explanation of what is actually happening in the world and why certain characters are acting the way that they are. There are long, ominous shots of almost pitch-black hallways and rooms where almost anything could jump out at you, and while almost nothing ever does the feeling is always there that it could definitely happen at any given moment, and the tight close-ups on people’s faces really make you feel a lot more uncomfortable as you can sense that they’re debating whether or not to go through with some extremely radical choices in just their facial expressions. An interesting thing that director Trey Edward Shults does whenever there is a dream sequence is to change the aspect ratio from 2:40 to 2:75, which highlights the different realm of reality that we are currently experiencing, though it is entirely understandable if audiences feel distracted by that and feel like it takes away some of the tension. One thing they cannot disagree on, however, is that the cinematography is rather outstanding in this, and very smartly used to build the right amount of tension. The performances are solid, with Joel Edgerton being especially strong here as this ordinary man forced into this tough situation, and like I said the cinematography is worth the ticket price alone, but this is the kind of film that will leave you feeling a bit dissatisfied from its lack of answers to the incredibly vague things happening around them. It’s like the first Purge movie, which sets up this intriguing concept but decides to go for a much simpler home invasion plot instead; with this, you want to learn more about the virus that has seemingly doomed humanity, but you’re never given a chance to do so, and you’re just stuck with this beautifully shot psychological horror that could have done a bit more with its set-up to leave audiences feeling more satisfied than they were. 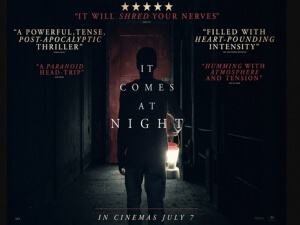 For the most part, though, I’m glad that I saw It Comes At Night, but you might want to know exactly what you’re getting into before you go and see it. It Comes At Night features some dazzling cinematography that builds tension in a much more subtle way than other films like it, as well as some strong performances including from Joel Edgerton, but it’s easy to see why audience reactions are far more muted than critics’ because there’s a lot of vagueness to the set-up that’s never fully explored and tends to leave you a bit cold and dissatisfied.